I ♥ Motherhood: Poppy Cat DVD Giveaway! 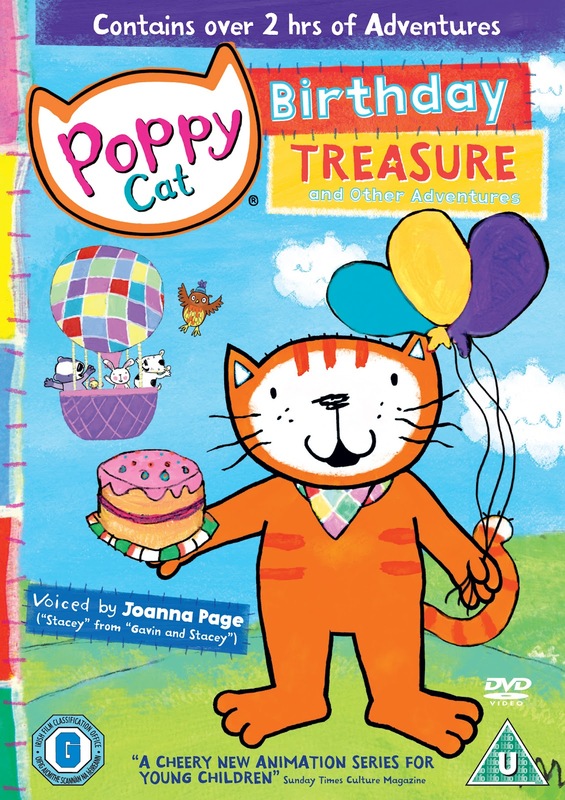 To celebrate the launch of Poppy Cat on DVD for the first time ever in ‘Birthday Treasure and Other Adventures’from 3rd September, Lionsgate has teamed up with I-Heart-Motherhood to offer one lucky winner the chance to win a copy hot off the press. Voiced by Gavin & Stacey star, Joanna Page, Poppy Cat is a great new British children’s animation based on the best-selling books by author Lara Jones, which have sold in excess of 2.5 million copies. ‘Poppy Cat: Birthday Treasure and Other Adventures’features 11 episodes (over two hours) of non-stop family fun. To win a copy of this fantastic DVD, all you have to do is give your answer in the comment box below and leave a way of contacting you. Who voices Poppy Cat in the popular TV series? For an Extra entry you can tweet the following "I've entered to win the @Iheartmuthahood competition to win a Poppy Cat DVD" Please add an extra comment below to say you have done this with your twitter ID. This bumper Poppy Cat DVD offers something extra special for all of the family. With any DVD purchase, families will receive a buy one get one free voucher into Chessington World of Adventures. If, like Poppy Cat, you enjoy the thrill of making everyday adventures extraordinary, then look no further than this exciting competition. ‘Poppy Cat: Birthday Treasure and Other Adventures’ will be available at all good retailers with a RRP of £12.99. For more information on the Nick Jr and CITV pre-school series and DVD launch, please visit www.poppycat.com, or become a fan of Poppy Cat’s on Facebook (www.facebook.com/officialpoppycat) or Twitter (www.twitter.com/PoppyCat_). This competition is UK only. The competition will close at midnight on Sunday 2nd September. The prize will be sent out by the PR to the winner.